Pamo is ready to ride! On Tuesday, March 20, 2012 (the first day of spring) we took another Day Ride. Our destination was downtown Jonesborough. We left our home in North Knoxville at 10:30 am. The skies were clear and the temperature was 65 degrees. We rode north on 11E, took 25/70 toward Dandridge, stopping briefly at Swann’s Marina. After a few photos, we continued on to Newport. In Newport, we took 321 North to Greenville, rode through downtown and then continued on to Jonesborough. We rode downtown only to find much of the main street being dug up for some sort of utility project. We went through a couple of alleyways until finally finding a place to park on Main Street. At the time of our visit, many of the shops in the historic downtown area were closed. Luckily, we found a wonderful place to eat called The Creekside. The Creekside in Jonesborough, TN. The folks were friendly and we both agreed it was one of the best meals we’ve had on one of our Day Ride’s in a long time. It was well worth the trip. Jeff wonders if he can dig into that cake already! Pamo knows it’s okay to eat the cake already. Interior view of The Creekside. After lunch, we walked around town and got some more photos. There are plenty of historic sites in Jonesborough- the oldest town in Tennessee. After visiting awhile, we got back on the bikes and headed north on 81 to Kingsport. Just south of Kingsport we took 374 West toward Rogersville. We stopped for a few photos of this lovely, gently winding country road. Once in Rogersville, we stopped to gas up and get a cold drink, then continued on. We took 11W from Rogersville to Bean Station then continued south through Rutledge and finally back into Knoxville. We got back home at 5:30 pm and our total ride was 225 miles. The fur kids were glad to see us home. 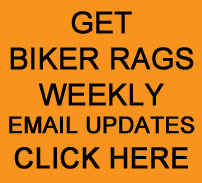 This entry was posted in Day Ride and tagged Biker Rags, Day Ride, Jonesborough. Bookmark the permalink.